It is not surprising that as technology advances, so does the number of available products, particularly within the leisure equine industry where disposable income is often assumed. 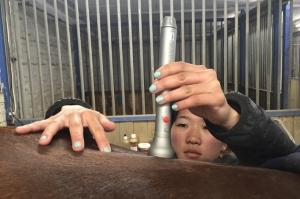 Without a doubt, some of these products are fantastic additions to the market – the increase in diagnostic equipment and monitoring tools will hopefully encourage much-needed awareness of the impact we are having on our horses, leading to improved management and riding trends for the benefit of the horse. Such devices include exercise trackers, under-rug temperature/sweat monitors and wearable vitals monitors, often with data accessible by mobile phone. Their use, for those that train sports horses professionally, as well as leisure riders with a high-end concern for welfare and progress of their animal, should hopefully assist but not replace any veterinary or therapist intervention that becomes necessary. However, as I circulated the stalls charging enormous amounts for seemingly quick-fix ‘treatment’ options, I started to feel really quite uncomfortable. These options include rugs and boots using magnetic and electromagnetic therapy, vibrating platforms for ‘increased muscle tone’, laser therapy devices for treatment of injuries, heat therapy pads/mats and electrical ‘massage’ rugs to name just a few. In the hands of a qualified therapist these gadgets may well be a helpful addition to their toolkit, but I for one have concerns that these gadgets are increasingly available for use by owners or unqualified ‘therapists’ directly, without the required training, guidance or knowledge of the potential harmful side-effects of their use. For example, heat and cold as methods of assisting in soft tissue trauma seem like simple solutions, but in fact either can be harmful to an injury when used at the wrong time in the healing process. Unnecessary use, especially with the ease and efficiency of application of these thermal ‘wraps’ could in fact cause damage or discomfort, despite the good intentions of a conscientious owner. In addition to this, when you actually start to dig into the research on the use and benefits of these gadgets, you realise how little has actually been carried out, or indeed how contradictory the evidence is. Magnetic therapy, as an example, appears to have very limited success in independent clinical trials, and experts appear hugely divided in their opinion on its benefit to the horse. One item for which it’s ease of availability I find slightly unsettling is infra-red thermo-imaging equipment. In professional hands, this equipment is an amazing diagnostic tool, but there is surely potential for misdiagnosis in unprofessional hands? I feel that some more confident owners may start to rely on such gadgets, combined with their own limited knowledge, instead of calling on essential veterinary or other professional intervention. In conclusion…exciting times for technology in the equine industry. However, I hope these gadgets are used with caution and in the right hands, and that the increased awareness and convenience provided results in only a beneficial outcome, not a detrimental one, for our ever-patient horse ‘gadget-guinea pigs’! Couldn’t agree more with this post! I definately agree especially with the thermo imagining. I think could be very good in the right hands. I had a friend who was trained how to properly take the images and worked through a company so that the a vet would look at them and provide a full report as feedback, her competiton in the market, however, was someone who went out and bought the camera, had no training therefore the images would of been useless if shown to a vet.